Starting from a relatively modest plan to revise Bill Boddy’s 1973 soft-backed compilation of his own on-the-spot race reports published as The Motor Sport Book of Donington by adding many more photographs and “a more creative layout” to coincide with the 60th anniversary of Tazio Nuvolari’s victory in the 1938 Donington Grand Prix, John Baillie has, instead, produced what must surely be the definitive history of the Leicestershire circuit in time to mark the 80th anniversary of that momentous race. 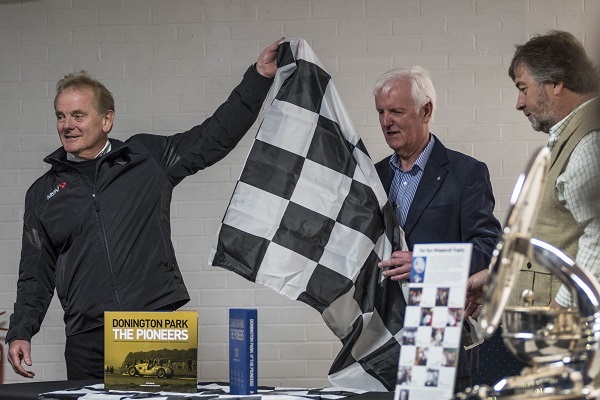 In the meantime, he has gathered a tremendous amount of information, documentation and recollections of an amazing number of people connected with Donington, from spectators to officials, and combined it with hundreds of photographs and illustrations to bring the story to life. Bill Boddy’s contribution has remained central to the story, as many extracts from his eyewitness reports of the pre-war races appear throughout. Donington, of course, is the only race circuit in current use on the UK mainland with a history stretching back to pre-WWII days. Thanks to the war, it is not a continuous history and the book is appropriately subtitled as a tribute to those who created . . . and saved it . From the Domesday book of 1086 which mentions the extensive woodland in ‘Dunitone’, the estate’s history is traced through to the 1931 meeting between Fred Craner of the Derby & District Motor Club and then owner John Gillies Shields which swiftly led to the first – motor cycle – race meeting at Whitsun that same year. The circuit’s glory years up to war are covered in fascinating detail and well illustrated with superb, well reproduced photographs as, indeed, is the whole book. The war years when Donington was used by the army mainly for vehicle storage are recalled. In the mid-1950s, preparing for his thesis on redeveloping Donington as a Grand Prix circuit, Ian Preston, then studying at the Nottingham School of Architecture, took a series of photographs of Donington as it had been left by the army which are reproduced and make interesting viewing. The story of Tom Wheatcroft’s eventually successful efforts to acquire Donington and return racing there in the 1970s is well enough known for it to be covered relatively briefly as is the recovery from the disastrous plans for it to become an F1 venue. As one who has photographed and reported from Donington since its revival in the ‘70s and never been quite sure of how some of the current layout related to the pre-war circuit, I found Baillie’s clever combination of original photographs with his own recent ones taken from the same viewpoint fascinating in their confirmation – and sometimes correction – of my understanding. For this and many, many other aspects the book is thoroughly recommended. 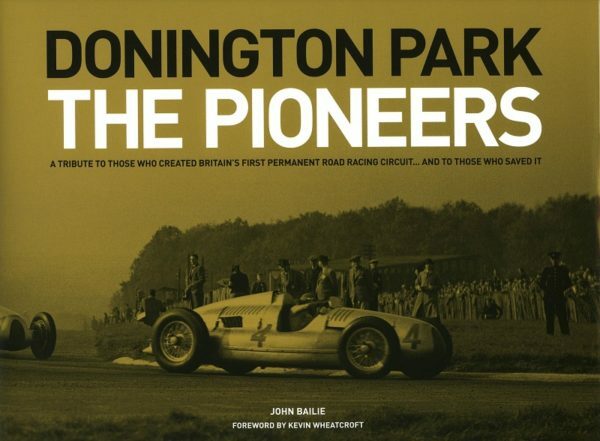 As well as the standard edition, a signed, slip-cased ‘anniversary’ edition of just 85 copies, reflecting the number of years since Donington’s first race in 1931, is available at a £100 premium on the standard price. Price: £85 (Standard Edition). Hardback (11½ by 9¼in). 348 pages, copiously illustrated with b&w and colour photographs and illustrations. Unveiling of the book at its launch at the Donington Collection on 24th October (less than a fortnight before the Collection’s regrettable closure). 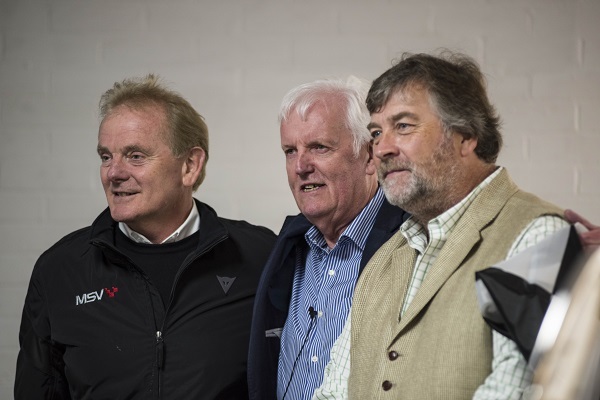 Left to right are Jonathan Palmer, CEO of MotorSport Vision, the current Donington operators, author John Baillie and Kevin Wheatcroft, current owner of Donington Park.